The clean flavour of the lychees marries well with fresh pineapple, clementines and slivers of stem ginger. Physalis in their paper lanterns add the last exotic touch. 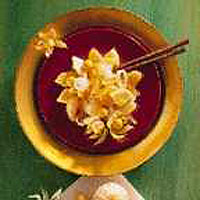 Although cream is not normally used in Chinese cooking, the fruit salad is delicious served with cream laced with a couple of drops of almond essence. Squeeze the juice from two of the clementines and pour into a serving bowl. Add the lychees. Cut away the skin of the pineapple, remove the centre core with a knife or apple corer and cut the pineapple into segments. Add to the salad. Peel the remaining clementines, break into segments and add to the salad. Slice the ginger into thin slivers and add to the bowl with the syrup. Open the physalis and remove most of the fruits but leave some in their papery husks and arrange over the salad. Chill for 30 minutes before serving.